You’d think I would end the year with a happy book. I didn’t, but The Marrow Thieves, by Cherie Dimaline was really good. Publisher’s Summary: Humanity has nearly destroyed its world through global warming, but now an even greater evil lurks. The indigenous people of North America are being hunted and harvested for their bone marrow, which carries the key to recovering something the rest of the population has lost: the ability to dream. In this dark world, Frenchie and his companions struggle to survive as they make their way up north to the old lands. For now, survival means staying hidden – but what they don’t know is that one of them holds the secret to defeating the marrow thieves. That description doesn’t really indicate the power of the writing. Main characters’ back stories are told in “coming to” chapters. Storytelling is woven in. And Dimaline creates a Canadian wilderness impacted by global warming that seems terrifyingly probable. The book is full of loss and sacrifice, but the beautifully lyrical language of the book makes it worth reading. I can’t quite recall how I got wind of these two graphic novels about restorative justice within indigenous communities of Northern Canada. I’m sure glad I did, though. Both explore the issues that led the protagonists into the justice system and follow them as they reconnect to their traditions. 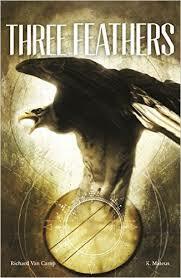 The first book, Three Feathers, written by Richard Van Camp and illustrated by Krystal Mateus, tells the story of three young men sent to live on the land after wreaking havoc in their community. 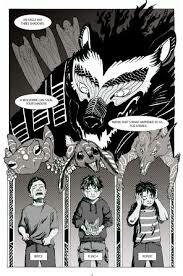 The book is Mateus’ first graphic novel, but the black and white pictures effectively capture their story. Publisher’s Summary: Three young men — Flinch, Bryce, and Rupert — have vandalized their community. They are sent by its Elders to live nine months on the land as part of the circle sentencing process. There, the young men learn to take responsibility for their actions and acquire the humility required to return home. But will they be forgiven for what they have done? Three Feathers explores the power and grace of restorative justice in on Northern community and the cultural legacy that can empower future generations. The book is published by a small Canadian press, Highwater, a division of Portage & Main Press and is available in several Indigenous languages. 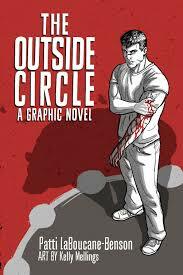 The Outside Circle, written by Pattie LaBoucane-Benson with art by Kelly Mellings, isn’t an easy read. It touches on things I know of only peripherally and calls readers to face up to Canada’s treatment of its indigenous people. The full color illustrations really bring the story to life. 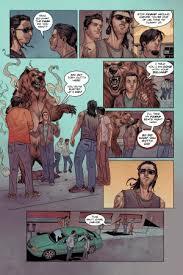 Publisher’s Summary:In this important graphic novel, two Aboriginal brothers surrounded by poverty, drug abuse, and gang violence, try to overcome centuries of historic trauma in very different ways to bring about positive change in their lives. This graphic novel comes to us from The House of Anansi Press. A homecoming should be a wonderful celebration, but it isn’t when Margaret returns after 2 years away at a residential school. Margaret was sent away from her Arctic home at age 8 to go to school and was not allowed to speak her language, eat her food, or learn her people’s traditions. 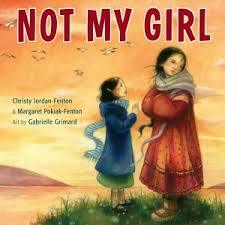 So, when she returns home in Not My Girl by Christy Jordan-Fenton and Margaret Pokiak-Fenton, she is unrecognizable, “not my girl”. As the story unfolds, slowly, Margaret relearns all she had lost during her two years away. She regains her family’s trust and finally feels that she has found her home again. From the publisher: Based on the true story of Margaret Pokiak-Fenton, and complemented by evocative illustrations, “Not My Girl” makes the original, award-winning memoir, “A Stranger at Home,” accessible to younger children. It is also a sequel to the picture book “When I Was Eight.” A poignant story of a determined young girl’s struggle to belong, it will both move and inspire readers everywhere.